I was born in Boston, Lincolnshire (actually in Wyberton West Hospital, which no longer exists), educated (if that's the word) first at St Mary's Primary School (run by nuns at the time, which probably explains a lot about my later career if you're a Freudian, which I'm not. Its new incarnation is here), then at Boston Grammar School. At the latter I successfully navigated 'O'-levels, but nearly half-way through my 'A'-levels I developed a number of extra-curricular interests which distracted me from my studies. More importantly, I began to think rather more broadly than some of my teachers (and especially my appalling headmaster) cared for. This led to an almost total cessation of interest in my 'A'-levels. It did, however, involve a number of stage rôles at Blackfriars Theatre and elsewhere, and a good deal of time spent in the theatre bar. When I left school at 18 I headed for London, with the firm expectation of a career on the stage. A year in which I got to know students from a number of drama schools told me that I couldn't spend three years in such company; meanwhile my interest in writing poetry became more intense. I began performing regularly, especially at the Troubadour in Earls Court, and grew increasingly confident about my work. I became involved with the National Poetry Society, then in Earls Court, helping with the magazine and with various events, and in 1976 I published my first slim volume ("A Secret Tear"). This was followed by "Deja Vu" and "insofaras". My income was supplemented by readings, work in schools, and some broadcasting (Capital Radio). I also organised the occasional Poetry (sometimes with jazz) Festival, and ran workshops (at the Centre in Trafalgar Square and at the Riverside Studios). I started my own small press (tapocketa press), and then collaborated with Alaric Sumner on a magazine ("words worth"). All this came to an abrupt halt for various reasons, and I took a dull and ordinary job - temporarily, until I got my poetry activities together again. Three years later I was still in that temporary job, and I suddenly realised that I was in danger of running myself into very deep rut. My way out (though I had positive reasons for taking it as well as the negative reasons) was to do a degree. In 1980 I went to Middlesex Polytechnic (now Middlesex University), where I read Humanities (though after the first year I did little but Philosophy, and some computing). I'd been interested in Philosophy for about a year, but the course deepened and strengthened that interest. I had some excellent teachers, the options were varied, and the course was flexible. My College was Brasenose. 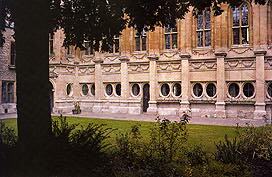 After matriculating in 1983, I spent much of the next few years under (rather than in) the College library, in the Hulme Common Room. My time in Oxford saw a brief resurgence of poetry writing, and I also began translating poetry from modern Greek with my partner, Andrea Christofidou. I was published in magazines such as ninth decade, and our translations appeared in the Oxford Magazine and the Worcester College record. Work and music took over, though, and I wasn't to return to poetry again until much later. I began to get involved with music in a fairly big way, playing in a band called originally "Captain Swing", but then (after Michelle Shocked unforgivably stole our name for one of her tours) "Akouste!". We played a wide variety of music, mainly traditional from many countries (the British Isles, France, Galicia, Greece, Cyprus, China, Japan, etc. ), but also South African kwela, the blues, some renaissance, and some of my compositions. We played in pubs (for three years we played every week at the Bullingdon Arms in Cowley Road), for functions such as weddings, balls, fund-raising events (especially for "Education for Democracy in South Africa"), and for a while we had a regular slot at the Oxford Museum of Modern Art. In addition I played for a while with the Oxford (Javanese) Gamelan. After various ups and downs I finished the B.Phil. and the D.Phil., and was faced with the unnerving prospect of losing my long-term identity as a student. I went on to a series of lectureships at various Oxford colleges, as well as teaching for Birkbeck College and King's College, London, the Univcersity of Noth London, Reading University, and the extra-mural/coninuing education departments in London and Oxford. I'm now Lecturer in Philosophy at Pembroke College, Oxford and at St Edmund Hall, Oxford, and I teach forr the University of Georgia's Oxford Programme. Apart from professional papers, more popular articles, and reviews (for some of which see here), I've written One Hundred Philosopher (2004: U.S. — Barron's; U.K. — Apple Press; Australia — ABC Books), which has been translated into over twenty languages. In 2013 I began to get back into writing poetry, as well as translating from German (mainly the poetry of Gustav Sack). I've recently been published in a number of magazines, print and on-line, including Acumen, Tears in the Fence, Dream Catcher, Lighthouse, Ancient Heart Magazine, streetcake, The Stare's Nest, Ink, Sweat, & Tears, Crowsfeet, I Am Not a Silent Poet, Poetry Cornwall, the Oxford Magazine, New Walk, Three Drops from a Cauldron, The Curly Mind, Molly Bloom, and Offbeat/Quirky Fiction. My latest collection is: Adding Colours to the Chameleon (Wisdom's Bottom Press), available here, and my next will be All What Larkin, out late in 2016 from Albion Beatnik Press. I've also regained an interest in jazz and poetry, sparked by a session performing with Chris Garrick and Dave Gordon in Oxford's inimitable Albion Beatnik Bookstore; I'm the organiser of Poetry & Jazz at the 2016 Chipping Norton Jazz Festival. See also my (rather in need of up-dating) curriculum vitae.